PHYSICS 16 is a great class (NAMITA NABAR / The Stanford Daily). 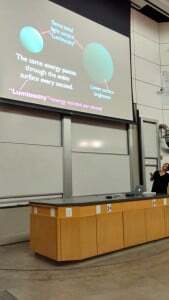 PHYSICS 16: “The Origin and Development of the Cosmos,” taught by Risa Wechsler, cosmologist and researcher at SLAC, offers students an introduction to the physics principles that govern the universe. The class is one part of a three-course introductory astronomy program and explores basic concepts in astronomy and observation. 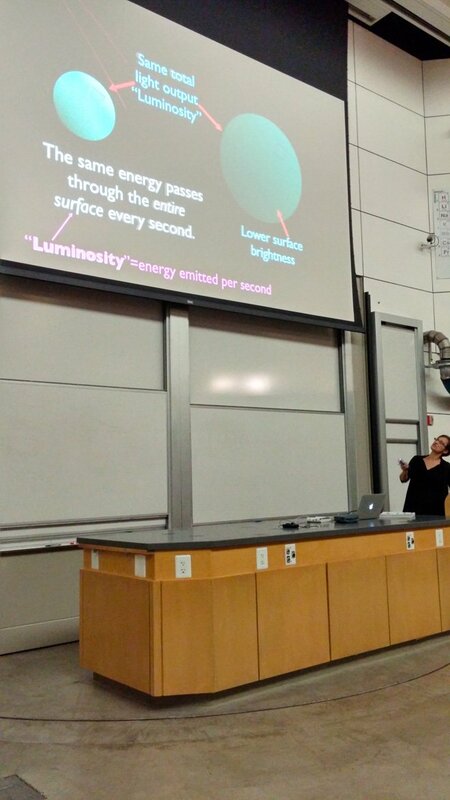 Lectures cover the history of the universe, from its early origins to the evolution of stars and galaxies. Through interactive clicker questions and problem sets, students grapple with fundamental astronomy concepts, from calculating luminosities of stars light-years away to analyzing stellar nuclear fusion. “We are essentially trying to cover the last 14 billion years in 10 weeks,” Wechsler said. Students learn to connect many of the topics to modern hotbeds of research in cosmology. For example, students are challenged to analyze evidence supporting the existence of dark matter and dark energy, both universally researched topics. “The material itself is not really difficult, but it answers all the questions you’ve ever wondered about,” said Zac Espinosa ’19, who is currently enrolled in the class. “Knowing that stars are related to the elements we came from is really interesting, almost philosophical,” Espinosa said. Another goal of PHYSICS 16 is to teach students how to draw valid scientific conclusions from numerical data and empirical observation. These skills are especially valuable in a field like cosmology, which has rapidly expanded in proportion to the increasingly advanced technology available. The class appeals to a diverse range of majors, from engineers and art majors to business school students. All students, from freshmen to seniors, can enroll. Students from all areas of study are drawn to the course because of its deviation from traditional astronomy courses. Physics concepts are introduced in a manner that is accessible to any student, regardless of previous STEM experience. The course does not delve into complicated physics or math, focusing instead on getting the cosmological “big picture” across. “Having a little bit of curiosity is enough for anyone to do well,” said Abdallah Abu Hashem ’19. The class is scheduled to make an excursion to Stanford’s Student Observatory, an opportunity only open to students enrolled in classes such as this one. The observatory is located near the Stanford golf course and will allow students to supplement the concepts they have practiced in class with real-life glimpses into the galaxy through the Stanford/SRI 45’ radio telescope.